Black cohosh or something else? Last year I conclusively identified black cohosh (Actaea racemosa) growing nearby. At the same time, I was seeing more plants which looked so much like black cohosh and yet I wasn’t quite as sure about these plants. 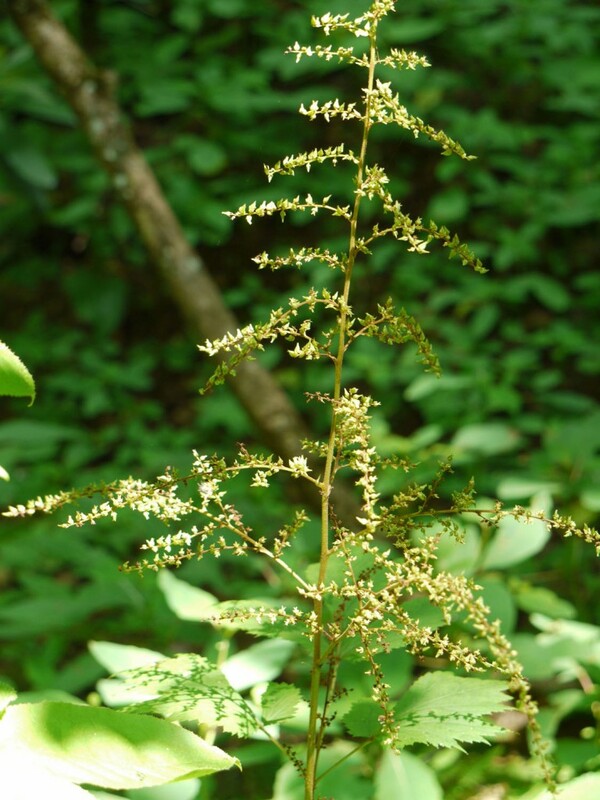 Were they really black cohosh? Flowers in 1 or several racemes 6″ or more long; found in woods. Tall plants with large leaves divided into numerous egg-shaped or oblong, sharply toothed leaflets. The white flowers appear to be all stamens since the petals are tiny and the sepals fall quickly. 3-8′ high. Flowers ill-scented; blooms from late June to August. The single pistil has a broad stigma. 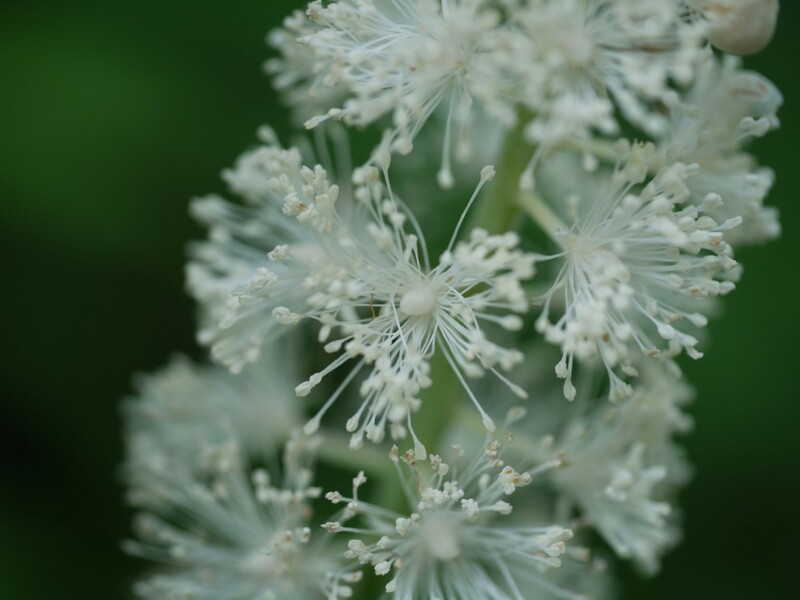 The flowers definitely are “ill-scented.” Let’s get a closer look at the black cohosh’s “single pistil with the broad stigma” . . .
White flowers in a large branching cluster of dense spikes 2-3″ long. 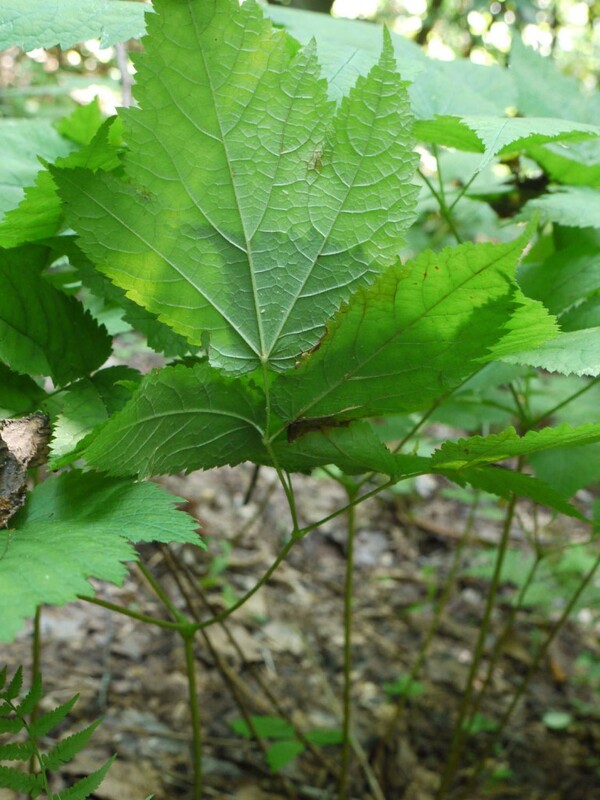 The leaves are 2- to 2-times pinnate, with large, egg-shaped leaflets. 3-7′ high. Rich woods and banks. Small, whitish-cream flowers in narrow, elongated spike-like clusters branching off a tall flower stalk. . . Leaves to 15″ long, compound, divided 2-3 times into toothed leaflets 2-5″ long. . . Flowers about 1/8″ wide; sepals and petals 5 each . . . male flowers with numerous stamens, female flowers with usually 3 pistils. Hhmm. Well this does not exactly look like the description given in the field guide. But wait, the Audubon guide has a bit more information . . . 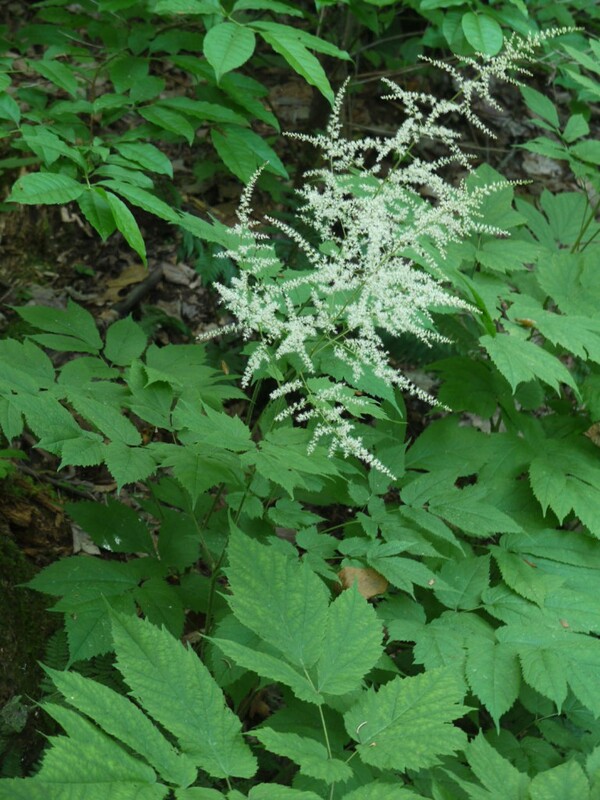 The very similar False goatsbeard (Astilbe biternata) . . . has a lobed terminal leaflet on each leaf and two pistils. Small, white or yellowish flowers in elongated clusters branching off a hairy stalk; clusters collectively form a large, much-branched, terminal cluster. Flowers about 1/8″ long; petals 4-5; stamens 10; pistil 1, with separate styles, splitting into 2 sections. . . . Leaves to 2′ wide, compound, divided into 3 parts and again divided into 3 toothed or lobed, ovate leaflets; terminal leaflet usually 3-lobed. Well, the two-style pistil and the lobed terminal leaflet are the confirming factors here. 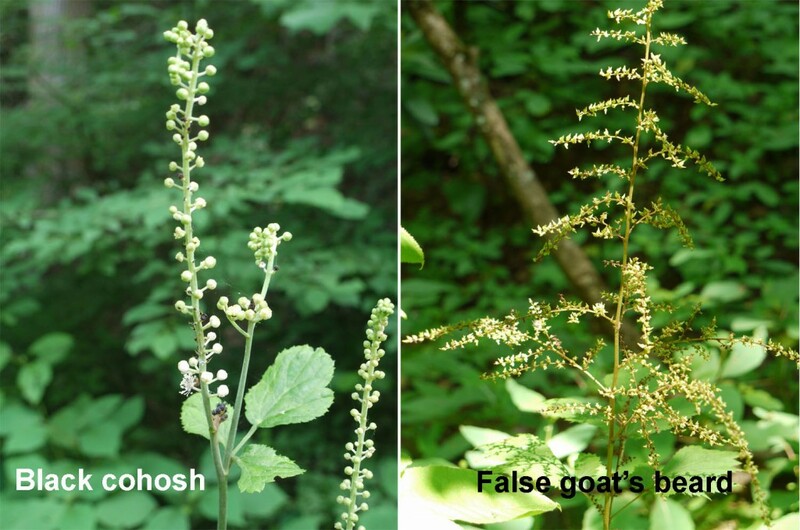 This “looks similar” plant is False goat’s beard (Astilbe biternata). For more confirmation, I would look at the USDA Plants Database site — along with a general Google photo search — to find additional photos and descriptions. Now that I know these two plants — and know that their leaves are so similar I cannot distinguish the plants from each other — I realize the only way I can make a final determination of the plant’s identity is to see either the flowering stalk or the remains of the previous season’s flowering stalk. The tall one-two racemes with some leaflets at the base of the stalk tell me this is black cohosh. The spiky many-branched stalk tells me the plant is false goat’s beard. 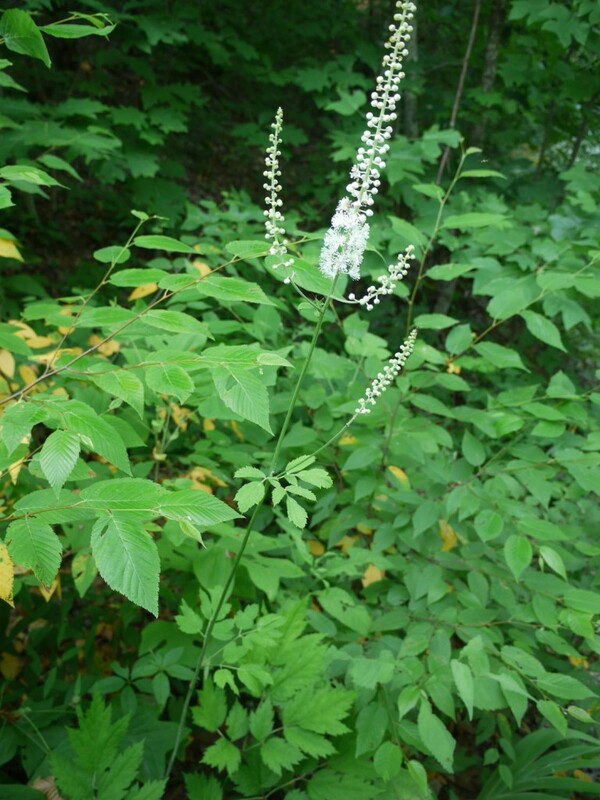 8 Responses to Black cohosh or something else? Thanks for the detailed pictures and descriptions. You are a brilliant scientist and teacher! Thanks so much for this! I’m sure I learned this years ago in herb school, but had forgotten it. A recent walk through Pearsons Falls had me confused! They have pics of both, and just when I thought I could tell the difference as I walked, and spotted, the confusion crept in. This really helps; thanks, Angelyn for doing the research that my time simply does not allow, right now! Valuable info. Yes, thank you for this! Thank you also for sending out your wonderful series of e-mails on identifying plants, and including a link to this article in a recent one. 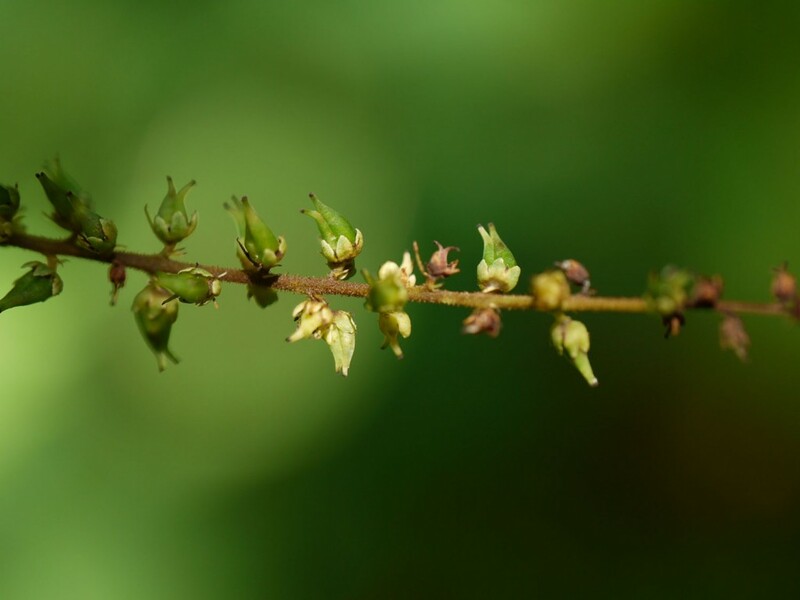 Did you use the Newcomb’s “system” to key the Black Cohosh and then see similar species listed there? Or did you use “picture-keying”? Or a regular dichotomous key? I like to know the names of plants, but I also like a systematic method of arriving at it! Val, I use quite a few methods when it comes to identifying a plant. I own a number of field guides because each guide’s author has a different selection of plants. And each field guide utilizes different keying methods. 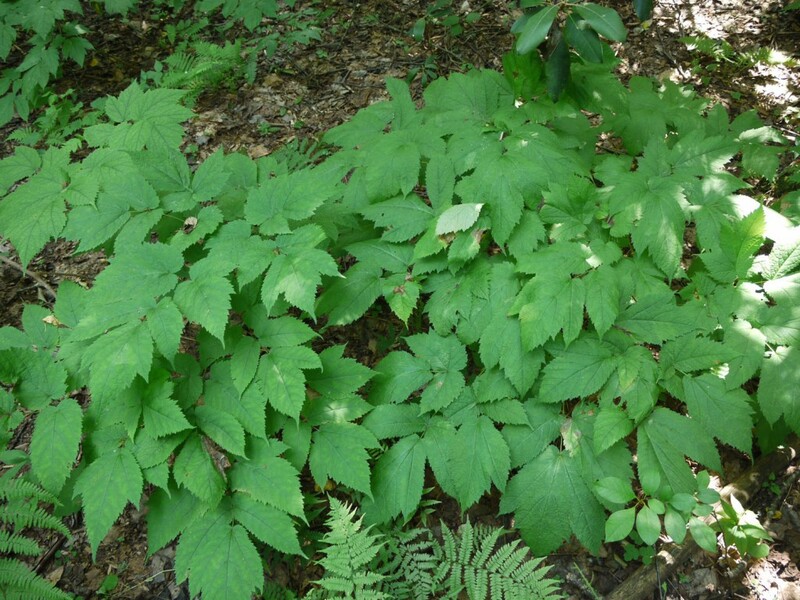 As I recall, when I first attempted to identify Black cohosh, I used Newcomb’s and looked through the illustrations for leaves that might be close to what I saw on the plant. Love the detail. This is amazing. You are amazing! Thanks so much. This is exactly the process that we all should go through when trying to identify. I’ve found that there are so many conflicting resources out there! Best to get our hands dirty and get up close. Keep being awesome! Thanks for this info. 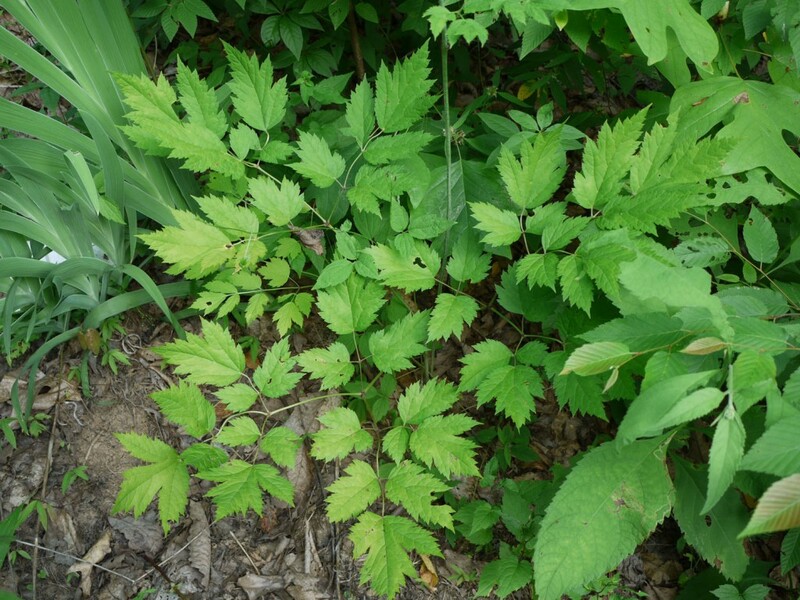 Helped me in eliminating Black Cohosh and False Goats Beard as possibilities for an unknown, volunteer rogue plant near my creek. Foliage looks nearly similar, with small white flowers and now is fruiting a parchment looking casing with a small cherry/pea looking fruit inside. Chinese Lantern? Edible? Thanks for your help. Thanks for enlightening us with this very important comparison.